100 Million Tree-Planting Initiative Launched By Arbor Day Foundation | "Global Possibilities"
The Arbor Day Foundation recently announced its Time for Trees initiative, which aims to plant 100 million trees by 2022. Individuals, communities, governments, and corporations will join together to complete the work. Some of the corporate supporters are Bank of America, Bass Pro Shops & Cabela’s, Church & Dwight, and Exelon. The website for the tree-planting initiative is Time for Trees. Dan Lambe, president of the Arbor Day Foundation, answered some questions for CleanTechnica about the tree planting. According to the press release, 100 million trees can remove 578,000 tons of chemical pollution from the air. What chemicals are removed, and why is that important? Trees remove chemical pollution and small particulate matter such as NO2, O3, SO2 and PM2.5 from the air we breathe. This has significant health implications. The US Forest Service estimates trees in the US save more than 850 lives and prevent 670,000 cases of acute respiratory symptoms each year by reducing air pollutants. What kind of trees will be planted, where and by whom? We choose tree species based on the strategic recommendations of our local planting partners in forests and communities worldwide. Our top priorities are ensuring diversity and planting trees that will be healthy and resilient long-term. Ongoing care and maintenance are critical. Each year of Time for Trees, our focus and specific tree planting projects will vary. In 2019, we’ll be planting in 24 states across the U.S. and 11 countries around the world. That includes a brand-new partnership with the American Forest Foundation to replant 8,000 acres of forest in California destroyed by recent wildfires. How can you organize and manage such a massive tree planting project? When we set our ambitious goal of planting 100 million trees, we knew we couldn’t do it alone. That’s why we’re working with such an extensive, diverse group of partners – including our nearly 1 million members, local governments, industry-leading private companies, more than 100 Alliance for Community Trees members (local nonprofit planting organizations), both state and national parks, and forestry experts at the US Forest Service and National Association of State Foresters. To help us launch Time for Trees, we created the Evergreen Alliance – a hand-picked group of passionate, committed corporate partners that will serve as ambassadors. In addition to providing critical funding, these companies will spearhead tree-planting programs and educational campaigns to drive awareness and action. From investing in urban green space to replanting trees after natural disasters like hurricanes, wildfires and tornadoes, our Evergreen Alliance members are making an impact in communities across the US and worldwide. Will technology be used to do any of the planting, and if so, what technology? Several of our corporate partners in the energy and utilities industry – including Exelon and Oncor – participate in a program called Energy-Saving Trees. Through an interactive online tool, they teach people where to plant trees for maximum energy, air, water and carbon benefits. This program significantly decreases homeowners’ energy consumption and costs, while simultaneously greening communities and urban areas. How much will it cost to plant the 100 million trees? Time for Trees will be an investment of more than $200 million – funded by the Arbor Day Foundation, our members, and corporate and community partners. Our allies recognize the urgency involved, and they view this initiative as a significant investment in our collective future. Will they be planted from seeds or seedlings, and where will they be sourced? It depends – we work with our planting partners to identify the best approach for each individual project. We source trees locally whenever possible. Our rural tree planting network is a great example. These partners source seedlings from local nurseries, and even the seedlings are grown from seed collected locally. Typically, the trees are grown at the nursery for 1-2 years and then lifted and shipped to the planting location when conditions are best for survival. How do you coordinate planting in various countries? We have strong relationships with local governments, nonprofits and private companies all over the world that will be instrumental in helping us get 100 million trees in the ground. This really is a massive undertaking, so their support and assistance is key. For example – we’re working closely with Omaha’s Henry Doorly Zoo and Aquarium on a variety of tree planting projects in Madagascar. Their team of experts is split between Omaha and Madagascar, which helps ensure we’re up to speed and receiving regular updates on progress. How did you choose the locations for planting? Each year of Time for Trees, our focus and specific tree planting projects will vary. We’re constantly talking with our planting partners, who have boots on the ground in local forests and communities, to determine the areas of greatest need. How many people will be involved in the plantings? We’ve committed to inspiring 5 million new tree planters through this initiative, which would be the largest mobilization of tree planters ever. Every tree counts – whether it’s one tree planted in someone’s backyard, or a large-scale reforestation project led by one of our corporate partners. That’s the beauty of Time for Trees. Everyone can participate and do their part. Time for Trees will be complete by 2022 – the 50th anniversary of the Arbor Day Foundation and the 150th anniversary of the Arbor Day holiday. But that doesn’t mean our work will be finished. We’ll continue to live our mission of inspiring people to plant, nurture and celebrate trees for years to come. 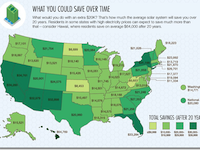 How much money can a solar roof save you in California?